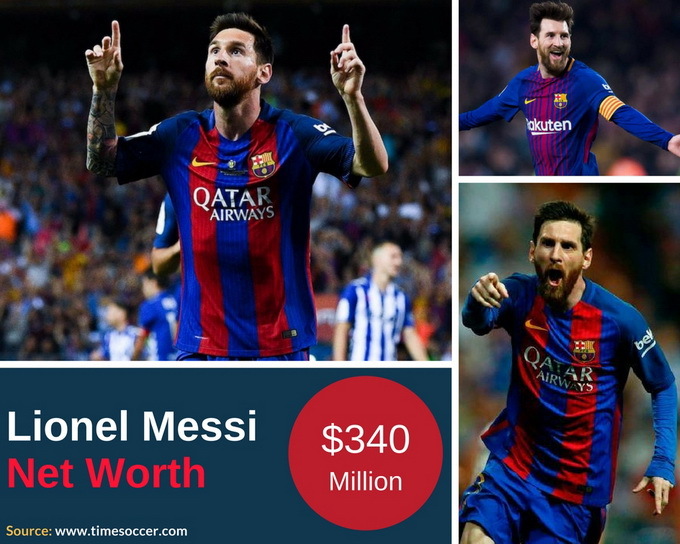 Lionel Messi Net Worth 2018 • How Rich is Barcelona Star? Lionel Messi is without a doubt one of the best footballers of all time, as the Argentinian player has made sure to make himself one of the most famous and respected athletes in the world. Messi is often compared to Cristiano Ronaldo in every aspect; it can be their success, the way they play and although is not as common as the others, some fans like to compare Messi’s net worth with Ronaldo’s and actually see who’s the highest paid between the two. Today we’re only focusing on Lio and how his talents have taken him to be one of the highest-paid athletes in the world at this very moment. Albeit his youth wasn’t precisely the best, Lio knew how to overcome every obstacle he had and ended up being the superstar he is right now. Messi has accolade plenty of things that have earned him lots of sponsorships and recently a huge contract extension with Barcelona that made him the best paid player in La Liga, surpassing Real Madrid’s stars Cristiano Ronaldo and Gareth Bale. So, how much does Messi make a year? What is Lio Messi salary story? Let’s break this down. After signing a contract extension with Barcelona in November 2017, Messi’s current salary is $44.68 million (£31.91 million), earning €565,000 per week and having a pretty high buyout clause of £623 million ($835 million). With plenty of sponsors such as Adidas, Pepsi, Dolce & Gabbana, Samsung, Turkish Airlines and Herbalife among others, he has added pretty good numbers to his bank account. Messi net worth is $340 million (£242.9 million), according to Forbes. While his salary is $44 million, his sponsorships and endorsements are estimated to be of $23 million per year. Although he tops the ranking in La Liga, Cristiano Ronaldo ranks first at the highest paid list as of 2017; Messi on the other side is second with an estimated $80 million (£57.1 million) per year counting salaries, endorsements, and sponsorships. Plus, Leo has also invested some of his money in properties in his native country. In Europe, Messi is the second-highest-paid behind Neymar, but surpasses his former teammate in the global ranking, being second and third, respectively. Besides his sponsorships and the campaigns he’s done, Messi has reportedly signed a major contract with Adidas that might last at least until the end of his professional career.